A number of weeks ago, my wife, Wanda, worked longer than normal at the Walnut Hills Nursing Home in Walnut Creek, Ohio. It was National Nursing Home week and she helps create events and activities for the nursing home residents. 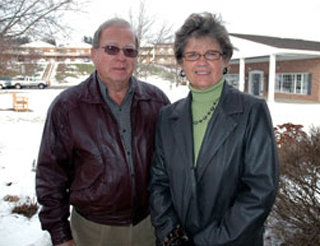 In the past she has also worked at the Walnut Hills Retirement Home which is adjacent to the nursing home. Walnut Hills has an excellent reputation in the community as a place that provides excellent care. Every summer Wanda and I enjoy attending the employee’s picnic and the “summer gathering” event that is held for families of residents. These events are well planned and executed and we always look forward to going. I spoke briefly with Paula Miller, the community relations director for Walnut Hills, who has been with the organization for eight years. She stated that Walnut Hills was founded in 1971, on a property that had previously been a farm, by Levi and Lillis Troyer. The Troyers started Walnut Hills when they were only in their twenties. Prior to Walnut Hills they had founded Shady Lawn Nursing Home in Dalton, Ohio. Through the years new facilities and services have been added to the complex, including the opening of the retirement home in 1976, one of the first assisted living facilities in the state of Ohio. The Commons, independent living facilities, were added in 1989 and expanded with The Meadows in 2004. This arrangement of facilities and services now offers a complete “continuum of care” where residents can “move up” in the level of care they receive. Walnut Hills has retained some long term employees, including current activities director Louise Hershberger, who has been there “since the beginning”; for more than 40 years. Iva Miller who works at the retirement home has been there for 39 years. Posted on a wall, I saw the names of many other employees who have been employed at Walnut Hills for 5, 10, 15, 20 years and higher. My aunt Melva Shrock, an Amish lady, also worked at Walnut Hills for many years. I spoke to her regarding her working experience at the home. She retired a couple of years ago. She said there were only about 3 or 4 residents at the nursing home when she started. I’m sure she’s seen a lot of changes through the years. She worked in various capacities including laundry, new admissions, social services, and working with residents and their families. When I asked her if she ever worked in the kitchen she said, “No, I only went there to eat. You know how us Shrocks love to eat!” To that, I can relate.